Egypt’s elections won’t be free or fair. But you won’t see fraud on Election Day. 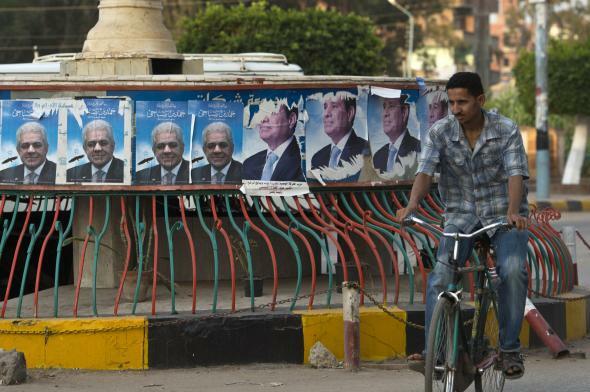 An Egyptian bicyclist rides past campaign posters for leftist presidential candidate Hamdeen Sabbahi and of Egyptian ex-army chief and leading presidential candidate Abdel Fattah al-Sisi, in Dekernss on May 15, 2014. Since the overthrow of President Hosni Mubarak in 2011, Egyptians have voted for constitutional reforms, parliaments, and presidents. They have seen many of those reforms, parliaments, and presidents overturned or ousted, one by one, often by decree. Elections do not a democracy make, and one can imagine the exasperation Egyptians feel at repeatedly showing up to “decide their country’s future,” and then seeing quite clearly that their vote may have little value at all. On May 26 and 27, Egyptians will again be asked to go to the polls in a major national election. The country’s upcoming presidential contest will pit the former head of the Egyptian Armed Forces, Abdel Fattah al-Sisi, against leftist politician and dissident Hamdeen Sabahi. Sisi promises firm leadership, security, and the close regulation of protests. Sabahi stands for social justice, Arab unity, and an independent foreign policy. Opinion polls show Sisi far ahead. The most recent survey, conducted by the Egyptian Center for Public Opinion Research (Baseera) in March, found that 72 percent of respondents would vote for Sisi and only 2 percent had chosen Sabahi. The remaining quarter reported to be undecided. Sisi is effectively the “president-in-waiting,” as Egypt expert Nathan Brown writes. For roughly the past year, Sisi has been the elephant in the room in Egyptian politics. He played a key role in the military’s ouster of former President Mohammed Morsi, a member of the Muslim Brotherhood, last summer. As the minister of defense at a time when the military was still very much in control, he effectively ran the country. In the months that followed, “Sisi-mania” swept across Egypt. To the chagrin of comedian Bassem Youssef—known as Egypt’s Jon Stewart—his countrymen have adorned jewelry with Sisi’s face and named shwarma sandwich combos in his honor. (Even Spanish-language pop artists are drunk on Sisi Kool-Aid, Youssef jokes, proclaiming: “Si, Si Señor!”) Egyptians have been raised to love their military, as Slate’s Will Dobson has pointed out. But Sisi is an obsession. He’s right. The current regime has put more than 10,000 people in prison and sentenced more than 1,000 to death, with civilians receiving shoddy military trials or no trial at all. It has cracked down hard on the media, activists, and targeted political factions. It has co-opted the judiciary to win politically motivated convictions, and remains entirely beyond the scope of government checks and balances. With no democratic transition really underway, what are we to make of the upcoming presidential vote? Is it a total sham, a mirage from start to finish? Will Egyptians really be able to cast their votes freely? There is a long and rich history of electoral fraud in Egypt. The Economist wrote in 2010 that the country’s “reputation for electoral sleight-of-hand remains well deserved,” with violations ranging from removing opposition candidates’ names from ballots and blocking their monitors from polling stations to shutting down some stations altogether to just stuffing the ballot boxes. There are videos from past elections of partisan thugs threatening voters with machetes and election officials filling in mounds of blank ballots. Those deeply engrained tactics have persisted and evolved in the post-revolution era. More to the point, election rigging has become a year-round activity and can be harder to spot. It’s possible that observers—including international ones—will witness some forms of fraud on Election Day. But with increasingly close scrutiny of the process, and the threat of (hopefully) swift condemnation from the U.S. government and others if it goes awry, would-be partisan troublemakers have wisened up. Meanwhile the Muslim Brotherhood, Egypt’s main opposition group at this stage (though prohibited from fielding a presidential candidate), has been labeled a terrorist organization. Sisi has promised to annihilate the group if he becomes president, and politically motivated convictions have imprisoned hundreds of its members and supporters. Campaign spending limits have been doubled since the last presidential vote, to the advantage of the vastly more wealthy military elite, and Sisi has been given privileged access to state media outlets to campaign. As opposition candidate Sabahi has protested, the Egyptian leadership continues to push its preference for the “single state candidate,” an idea that is deeply ingrained in national politics. In this environment, Sisi supporters won’t need to resort to day-of fraud to secure the result they want. Yet again, therefore, Egyptians will be asked to cast their vote in a decision that has almost certainly been predetermined. It is a familiar situation, reminiscent of the decades when Mubarak and his cronies won elections with 88 percent or even 95 percent of the vote. The military’s moves to effectively bar all competition to its rule have been met largely with silence in Washington. Taking advantage of a tired Egyptian populace, the junta has ushered a return to business as usual.